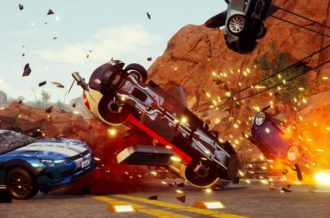 Two years ago, UK-based independent studio Four Circle Interactive released their first title, 10 Second Ninja, on Steam, with those who played it oft citing it as a sleeper hit, showing off the potential this new development team had for creating addictive and fast-paced 2D arcade action. Not content with this praise, Four Circle has returned with a sequel, 10 Second Ninja X, which improves upon and adds to the original in numerous beneficial ways with hopes of enticing a larger audience. Featuring smartly designed levels and controls, a surprisingly emotional story and a well-polished presentation, 10 Second Ninja X proves to be a delightfully brutal challenge for players who are willing to die repeatedly in short bursts of time. Per the title, 10 Second Ninja X tasks players with defeating immobile, often harmless robots in a ten second time limit, with only a sword and three gravity-defying shurikens at their disposal. 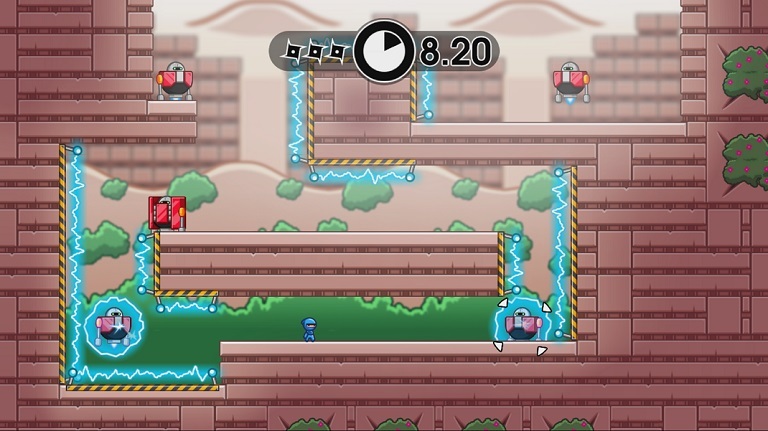 To complete these levels as efficiently as possible and achieve the three star goal, players must not only find the smartest path through the level, but then execute that plan to near flawlessness, with some of the more difficult challenges requiring pixel-perfect movement and throws. Fortunately enough, restarting is as convenient as a simple button push, allowing players to quickly return to the start after frequent time expirations and deaths. The leaderboards here are the main draw, as the currently small audience makes it all the more enticing for players to continue improving upon their time past what the game requires of them. While the simplistic controls explained in the brief tutorial make it easy for any player to master, the area which the sword hits is a few feet to the side of the player-character, a surprising touch which adds some (often much-needed) range to the sword, but takes some time to get used to, leading to some initially frustrating failures. 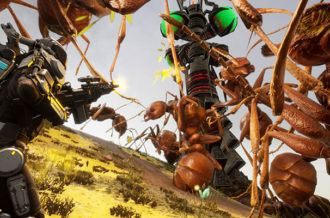 With new mechanics and enemies introduced every 10 levels to spice things up, the constant challenge and changes is enough to keep players enthralled throughout the 4 to 5 hour campaign. While 10 Second Ninja X would have been sufficient with merely a bare-bones story, with the core gameplay being the bigger draw, the text-based plot presented within has some surprising depth to it, with multiple humorous bits and enticing characters. The story starts out simple enough, with a plot reminiscent of classic Sonic games, as the speedy blue-hero who lives in the forest attempts to free his fellow critters after they have been imprisoned within robots by a large-sized villain with noticeable facial hair. Fittingly titled Greatbeard, the antagonist is one of several characters who has a significant arc throughout the story, as he evaluates his purpose in life while the silent Guardian of the Forest continues to quickly dismantle his life’s work. Despite a few jocular bits outstaying their welcome and an anticlimactic, although fitting, finale, Four Circle has cleverly turned numerous cliches on their head in order to provide an emotional journey that goes to show it’s never too late to change how you treat others. 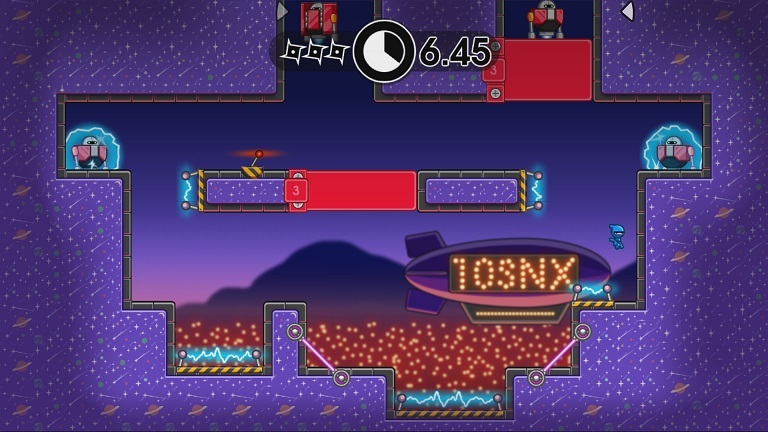 With the campaign only taking a few short hours, 10 Second Ninja X fortunately has plenty else to offer beyond it. All 60 levels of the original 10 Second Ninja are unlocked after the completion of the story, bringing the grand total to 100 challenges which will take a significant commitment to fully complete. Various unlockable costumes are also available to use after the story’s finale, while Marathon Mode tasks players with completing batches of levels as quickly as possible. A small memory-based mini-game rewards players with hint tokens to use in the main levels, which provides optimal routes for completing a challenge, a surprisingly beneficial reward considering how simple these tokens are to achieve. 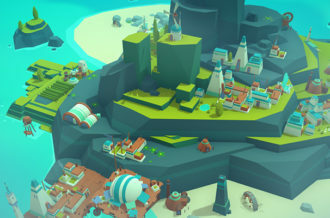 The hub world, Greatbeard’s flying spaceship, also houses numerous secret areas for players to uncover, most of which are found while trying to pursue a set of collectibles which unlock an unreleased sequel for a small indie title. The graphics of 10 Second Ninja X, while overly-simplistic, are polished and would translate well to small and large screens. While the hub area is eerily silent, each level batch offers a new, thematically appropriate background track, often relying heavily on the guitar. This guitar also plays a prominent role in the player’s progress through the game, as each new record set is accompanied by a brief, uplifting guitar rift. For the most part, the game is sufficiently bug-free, with a small number of levels containing odd issues including invisible electricity and the player-character getting stuck in a moving pillar. 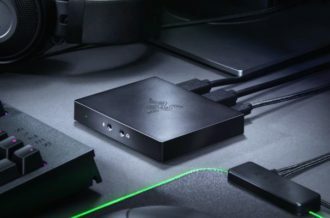 During the playthrough, there was also a hard crash when the controller got disconnected, but it was unable to be determined whether or not this was a one-off issue. Also notably and without warning, every enemy kill and player-character death brings a quick flash of red light with it, which could cause issues for light-sensitive players. Four Circle Interactive’s 10 Second Ninja X offers plenty of intensely difficult challenges for players willing to bash their head against it. 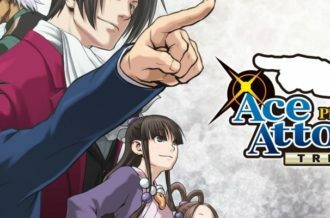 Its simple premise brings with it a remarkably emotional story, but the core gameplay is the true attraction, requiring players to continually restart for the sake of completion and competition. 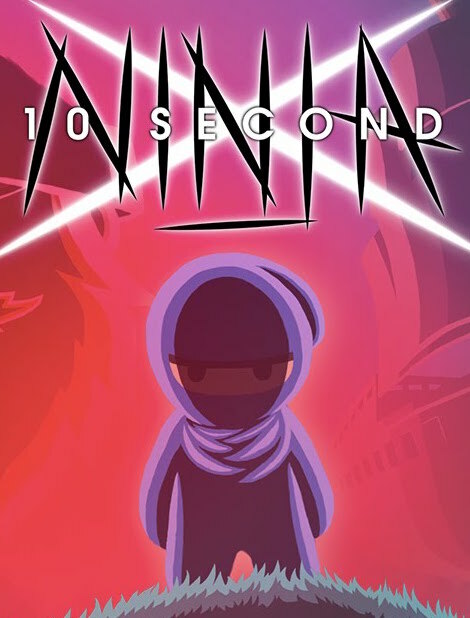 With several additional mini-games, collectibles and a polished presentation, 10 Second Ninja X offers quite a punch for its price and will make those who play it eager to see what else Four Circle has up their sleeves.